Woooo hooooo I’ve been so anxious for more Dark Hunters, and my wish has come true! Yours too? Maybe… cause guess what. 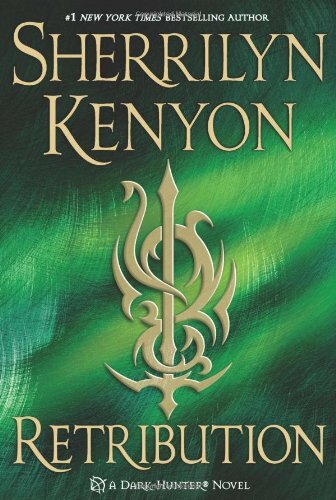 A lucky commenter is gonna win a copy of the latest book in Sherrilyn Kenyon’s Dark-Hunter series (Sundown’s book – best friend of Zarek (only friend of Zarek). Well, once upon a time anyway. LOVED Zarek, so I’m anxious to get to know Sundown a bit better 😉 Any friend of Zarek’s is a crush of mine! Released TODAY from St. Martin’s Press the next book in Sherrilyn Kenyon’s widely beloved Dark Hunter series, ‘RETRIBUTION’. In celebration of the release of Retribution (Dark-Hunter), St. Martin’s Press is offering a new book trailer and a chance for a commenter to win one copy of the book. How do you win it? Just leave a comment below, and by Monday August 8th 2011 at 9am EST, I will randomly select a winner. The winner will be contacted and will have 48hrs to respond with a mailing address (must respond by Wednesday August 10th 2011 – 9pm EST at the latest). I need to have the winner’s information sent to the publisher shortly after that (as per their deadline), so if you are picked, do not delay or you will lose your chance. Here’s a suggestion. If you want to enter to win the book, leave your comment, and you may also pre-send me your mailing address, by email, in case you do win (please don’t post it in your comment). In a couple of my past giveaways, there were some issues with getting the mailing address on time, and we almost didn’t make the deadline, so to avoid this, if I pick your name, and I already have your address, then all is good. Contest open to US or Canadian mailing addresses only. I’m so addicted to the dark-hunter series! I’m on Valerius right now. This is the first time I’ve heard of someone named Valerius other than my grandpa and great granpa. I can’t wait to read every day but will be sad when I’m caught up and have nothing else to read. Been wanting to read this series. It sounds good. Please enter me to win!!! Love them Dark Hunters. Would love a copy of this book, and have read all the Dark Hunter books up to this one! Thanks to my two reading buddies, Christy and Debbie for introducing me o Sherrilyn Kenyon and the Dark Hunter series. I have read all of them and waiting anxiously to get RETRIBUTION!!! It is an awesome series and look forward to getting into the Nick Chronicles!! Just recently got into these books, and I love them! I would love a copy of the new one! This series is on my TBR list. Would love to win. I guess i would have some catching up to do. Love the books. The author is a really nice person too! Can’t wait to read this book, hope I win!!!! Fantasy Lover was one of the books my bookstore manager friend gave me for my birthday 1 year ago. I enjoyed it but one of the other books was Dark Lover. I went with the vampires. They are my fav. I see that there are some vampires in the Dark Hunter series so Sherrilyn’s books are on my TBR list. By the time I get around to reading the series this book will possibly be available at the used books stores. BTW, I love the wacky little icons that are next to everyone’s post. I love this series. I can’t wait to read this book. Sherrilyn Kenyon is my favorite author and I have read every book she has written thus far! Been waiting impatiently for this one! Loved Zarek too and was definitley looking forward to reading Sundown’s story! love your posts! they are awesomely helping me to keep up with books i wanna read…would love to win a copy of this book…. good luck everybody! She’s another writer who needs to write faster! I miss Ash and Nick and all the DH and Were guys! Wow this sounds just up my alley! Ooh! I just started reading these after learning about them on your blog. I’m only three books in, but I’d LOVE to have a copy of her latest! Please enter me to win…yum a new dark hunter! Soooo excited about a new DH book. My faves so far are Zarek, Valerius and Vane. I love her Dark-Hunters series and she is one of my favorite authors. I have been re-reading past DH books while looking forward to read her latest one with Sundown!! Can’t wait to read more of Zarek too, he is one of my favorites!! Please pick me to win I love these books!! Dark Hunters are the way to go! One of my all time favorite series! I love this series! I can’t wait to read this book! love love love these books….. Win, win, win! I still haven’t read Dev’s book. This will give me incentive to catch up. Please enter me in this giveaway! I love this series. Vane & Zarek are my favorite. I love this series. Savitar’s my favorite. I hope he gets his own book soon. I hope I win. I am so excited I love this series and cant wait to read more of the dark hunters! I’ve loved each and everyone of the Dark Hunter series! I’ve loved each and every book from the Dark Hunter series! Well, I must confess, for a woman in her 40’s…I am addicted to these books. What really marvelous writing, and I have waited with baited, yes baited breath for this new book . No one i know reads the way I do, or the books I do and to find something so wonderful as these, well at my age you are hard pressed! Keep up the great writing, and I will introduce all I can to the world of The Dark Hunters. Here is hoping I win, what a great way to advertise for the series, a special copy just for me! Ravyn, Vane, …..well, now that I think about it. I have the hots for ALL the were-hunters! Great Site! Great reading this summer because of the suggestions I found here! I would love to win a copy of the book! I am a huge Kenyon fan. I am reading One Silent Night now and will hate when I am caught up in the series. Please tell me in which dark-hunter book does Acheron find his lifemate?? Thanks for coming back to me, I read Acheron and I cannot remember him finding his lifemate there, it’s just that in all the Dark Hunter books he is always a loner and wham suddenly in the last few books he has a lifemate. I shall read Acheron again perhaps it was to long ago. Thanks anyway.